BROOMFIELD, Colo. -- When I.M. Pain joined Baltimore's Charm City Roller Girls, she had years of speed skating experience. Although she was so fast that her lack of roller derby experience hadn't mattered in the small league where she started playing roller derby, as soon she tried to slip around veteran player Joy Collision at a Charm City practice, she realized what full contact was all about. "You have to move your shoulders," Joy told her after she got up off the ground. "That was a big jump for me," said Pain, whose given name is Kacey Huntington. Today, Pain and Joy, aka Marisa Singleton, are two of the leading jammers for Baltimore's roller derby team. 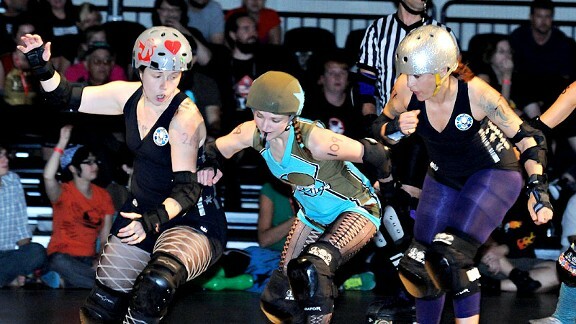 Jammers are the running backs of roller derby, the ones who wear the stars on their helmets. There is a lot of glory if they slice through the pack for points, but a lot of bruising if they get knocked around like pinballs. "It's a lot of mental toughness," said Margot Atwell, a copy editor who skates as Em Dash for the Gotham Girls. "I think the most important thing is to be able to pick yourself up and keep going even if it's really hard." There is also a tremendous amount of endurance needed. A lot of jammers train by sprinting on land in addition to lifting weights. Each jam is potentially two minutes, and the jammer could be sprinting for all of it. Olivia Shootin' John was one of the reasons that the Texecutioners were able to take out Minnesota in the first Saturday bout at the Women's Flat Track Derby Association's national championship. Her team had her jam back-to-back to overcome a deficit as fans shouted "Tex-as, Tex-as! Kill! Kill! Kill!" Olivia, whose legal name is Margaret Fackler, is a former soccer player and aggressive inline skater. She said she trains harder than ever in the five years she has played. "It 100 percent takes blockers to be a good jammer," Fackler said. "That's huge, having your blockers out there working for you. It helps you stay on your feet and keep going." Gotham defeated Rocky Mountain's Fight Club 174-138 in part due to the relentlessness of jammers Suzy Hotrod and Bonnie Thunders. After a tight bout, the Fight Club took a 100-85 lead, but penalties opened the door for Hotrod, who brought Gotham within a point to 100-99 in a single jam. One Bonnie Thunders jam later, and Gotham had a 129-100 lead. "It's a lot of prediction and mind-reading really," said Bonnie Thunders, aka Nicole Williams. "It's seeing things develop before they actually happen." Both jammers have superb footwork. Usually skaters at the position are some of the faster and more technically adept on any team. Sometimes jammers have to fend for themselves as their blockers focus on defending the opposing jammer, so there can be a lot of pressure that comes with the star. "I think you have to have the physical skill but if you don't have the mental game you'll never develop," Thunders said.